Lilium eupetes is a epiphytic species from Lao Cai Province, in the northwestern region of Vietnam. It is a rare and unique "tree dweller" found growing in the mosses on vertical tree trunks. Its seeds as well as bulbils are spread by the wind. When the leaves surrounding the stem bulbils die back in the fall, they wither and curl around the bulbils and act as a wind sail to carry the bulbils to their new location. Discovered by plant explorers Bleddyn and Sue Wynn-Jones in 2006 while searching for the long lost Lilium arboricola in northwestern Viet Nam. Lilium eupetes and Lilium arboricola are the true �Tree Lilies� of the lily world. 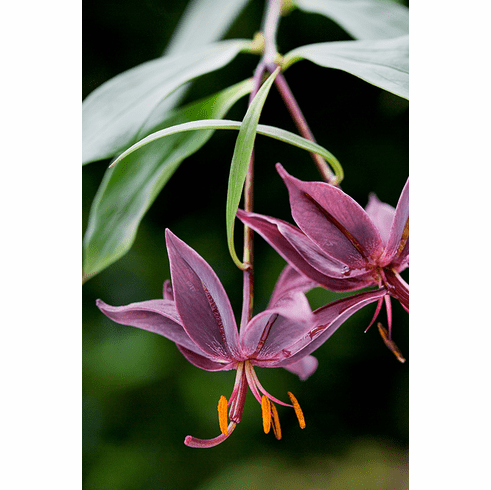 Unlike the term coined by many lily jobbers for the 'Orienpet' type lilies they offer from Holland, Lilium eupetes is truly a �Tree Lily�. Photo insert #2 shows just how Lilium eupetes is found in nature with its discoverers, Bleddyn and Sue Wynn-Jones. Two stems are circled for easier identification as they tend to blend in to their host. Photo copyright Bleddyn and Sue Wynn-Jones, all rights reserved, used with permission. The title photo of Lilium eupetes was graciously contributed by Andrea Jones of the United Kingdom and is � Andrea Jones/Garden Exposures Photo Library, all rights reserved. Used with permission. Insert photo #1 was graciously contributed by Bleddyn and Sue Wynn-Jones of the original first discovered plant of Lilium eupetes as found in Vietnam. At first thought to be L. arboricola as there were no flowers present, only seed pods, their find in 2006 proved to be a new and totally unknown, undiscovered species. It was with great excitement the morning the email containing this photo was opened. This is plant number 1 in its natural environment. Photo copyright Bleddyn and Sue Wynn-Jones, all rights reserved, used with permission.